Dad takes me for walks early in the morning before it gets too hot. 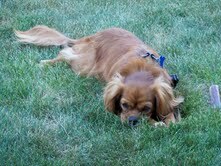 When we try to play outside, I get real hot, so I try to hide in the grass and cool off. It feels sooo good, I even took a nap! If you don’t hear from me next week, it’s because Mom and Dad are going on vacation – and I can’t go! They are taking the Carferry from Ludington to visit Joanne and John in Wisconsin Dells. 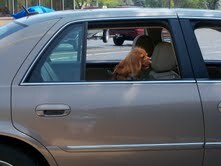 It’s okay with me, because pets have to stay in the car during the crossing. That would be at least four hours – what if I got sick – no one would know? Maybe they put the cars with pets in them in a certain place so someone can check up on them? It doesn’t sound like very much fun, BUT I am going to stay with Misty – now that sounds like more fun! 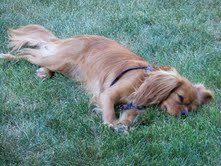 The last time I had a “stay-cation” with Aunt Deb and Uncle Howard, Misty didn’t live there yet. I stayed with them so they could start getting used to having a puppy around? Must be I wasn’t too much trouble – but this time I will be on my best behavior because Aunt Deb said she had some special things for us to do. One thing she already told me about is we will have a pool to swim in! I have never been in a swimming pool, but when it is so hot I’ll probably jump in with my fur coat on! …to view more Ruby’s Journal…..